NEVER POWER OFF, BOTH WIRELESS & WIRED: 1. The wireless mode: A built-in 400mAh battery provides up to 20-hr music time/15-hr talking time in a single charge; 2. The Wired mode: you can also use it as a wired headphone with the provided audio cable so the headphones will never power off. 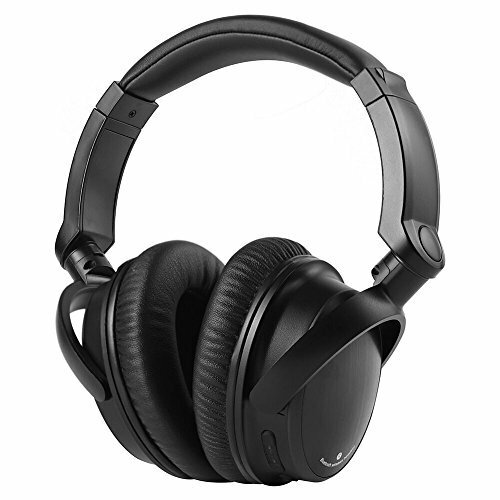 NO AUDIO DELAY FOR WATCHING TV, GAMING or PC: (You will need a SEPARATE transmitter to connect your TV if it is not Bluetooth) These top rated wireless bluetooth headphones work with a low-latency supported Bluetooth transmitter for minimum audio delay 32-40ms (human ear undetectable) for an advanced audio experience. SUPERIOR Hi-Fi SOUND: Experience superb music and voice clarity. Built-in bass boost (or bass off ) lets you tailor audio to your wireless bluetooth headphones for playstation, xbox, PC gaming, music or TV with rich lows and clear treble. Perfect headset for audio lovers. There is an User Manual included the package.